Life is constantly changing and sometimes challenges arise as a result of these changes that cause us to struggle. In working with my clients I strive to create a safe and supportive environment to understand, explore, and better deal with these challenges. I will work with you to identifying goals, and to develop ways to better deal with the obstacles and challenges you are facing. My approach to therapy is informed by interpersonal, cognitive behavioral, and experiential theories. In my work, I try to be open and flexible, and create experiences in session that support your efforts to make positive changes. Furthermore, I view each person I work with as a whole, and consider how cultural and family backgrounds as well as social justice issues impact you. I also consider the ways in which differences in cultural backgrounds may impact the therapy process. Adolescence is a transitional period. Some adolescents face difficulty during this transition. I work with adolescents who experience school stress, peer pressure, academic difficulties, bullying, difficulties with communication, anxiety, depression, family difficulty, identity issues, eating difficulties, and addiction. In my work with adolescents I focusing on helping adolescents learn to cope more effectively, make appropriate decisions, communicate better, understand and utilize their strengths, and gain insight and self-compassion. To me, family plays a significant role in an adolescent’s life. As a result, I work closely with adolescents and their families in therapy. I work with adults who experience a variety of presenting concerns including depression, anxiety, mood disorders, relationship concerns, trauma and violence, identity and cultural issues, eating concerns, women’s issues, grief, and loss. I will work collaboratively with you to explore how your difficulties are impacting you. In this process, I will work with you on finding ways to better draw on your resources and strengths, and help you develop the skills you need to overcome your concerns. Azadeh Fatemi, Ph.D., is a licensed clinical psychologist who has been providing mental health services for more than ten years. 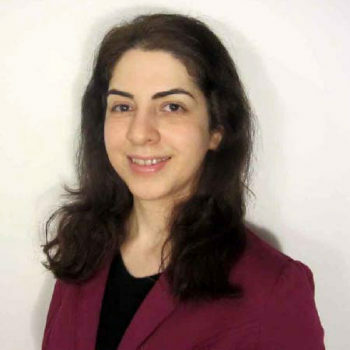 Azadeh has worked in a broad range of settings including university counseling centers, community mental health, and private practice. To reach Azadeh Fatemi, call 630-586-0900 and leave a message at ext. 29.